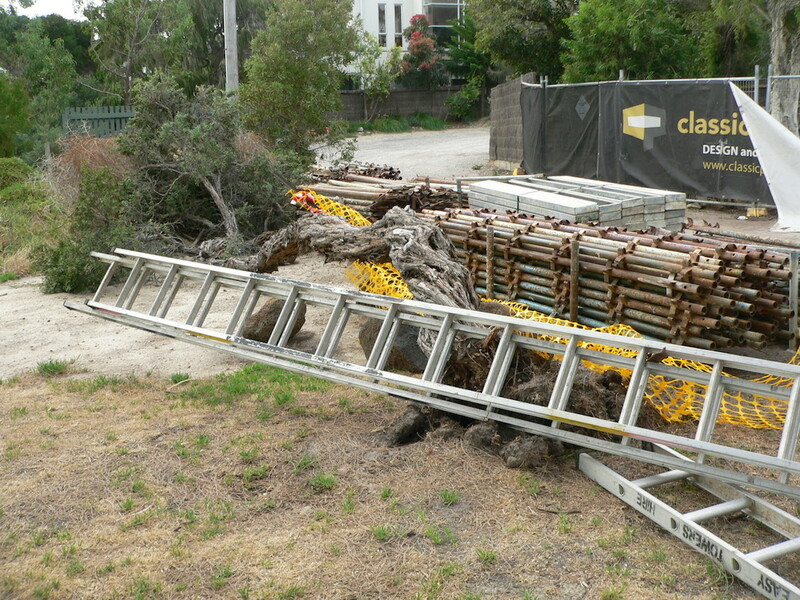 The repeated misuse of the Ricketts Point Landside Reserve, and coastal Crown land adjoining it, by vehicles entering it, and for storing builders’ materials on it, should be prevented by Bayside City Council installing a suitable vehicle barrier between it and the access road from Point Avenue to houses near it. Bayside Council should amend its Ricketts Point and Ricketts Point Landside Reserve Management Plan to include a PROGRAM for achieving a gazettal to revoke excessive and obsolete road reserves, and create a new road reserve using much less area, to make the Landside Reserve a single entity, with a single zoning and purpose, to replace the ad hoc fragmented road reserves and car tracks now there. 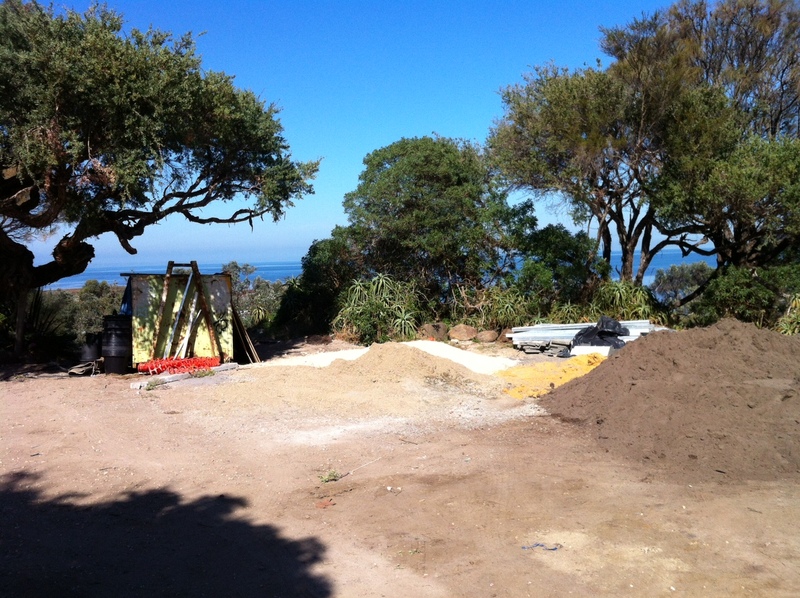 Unfortunately, in April 2014, Bayside City Council granted a permit to remove 11 trees from the Ricketts Point Landside Reserve and for it to be used as a worksite to remove debris from a landowner’s landslip. See a legal opinion on unauthorized structures, etc. on road reserves. 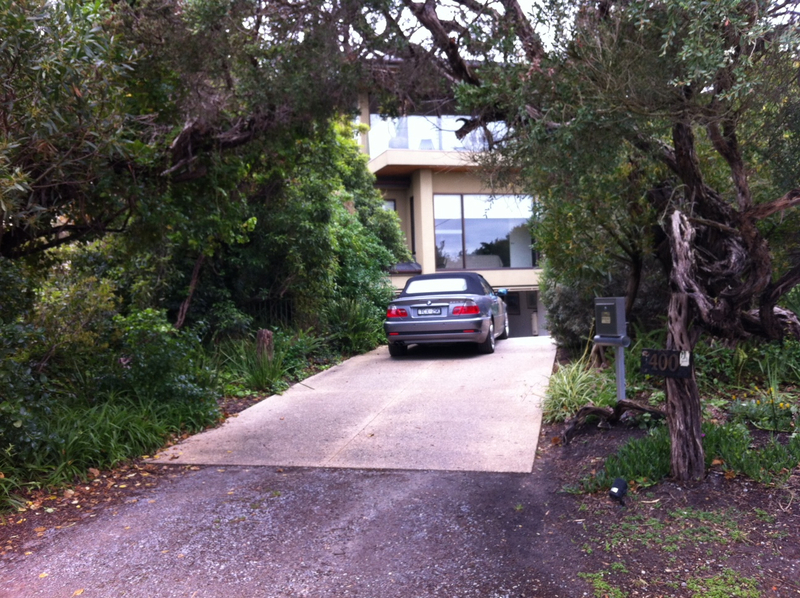 Ricketts Point Landside Reserve from 402 Beach Road, Beaumaris, April 2013. See December 2013 view. 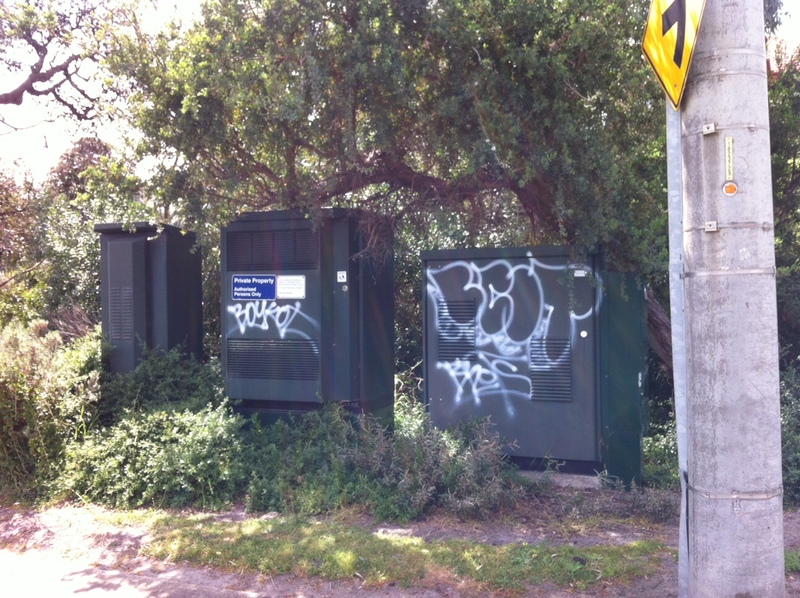 See BCS Inc. April 2013 letter to Bayside Council urging an end to this mess, and a barrier to stop such acts. Council’s reply left much to be desired. BCS Inc. is still pursuing this. See detail below. 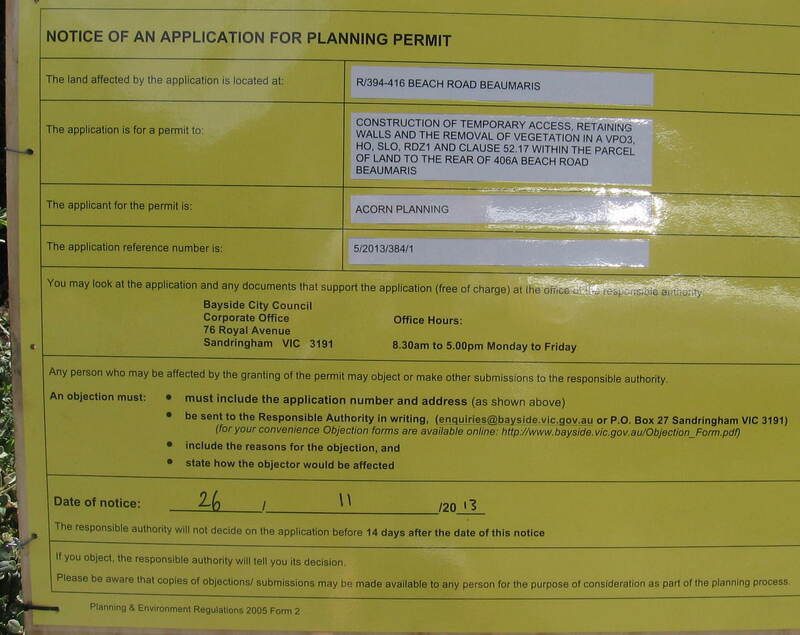 Bayside City Council’s letter of 2014-03-12 had a plan – whose outcome appears below – for its yellow mesh barrier that demarcated the access road from the Landside Reserve – dumped on by builders’ items above – to be replaced with a line of bollards from 405 Beach Rd, Beaumaris, to the north side of Point Ave. 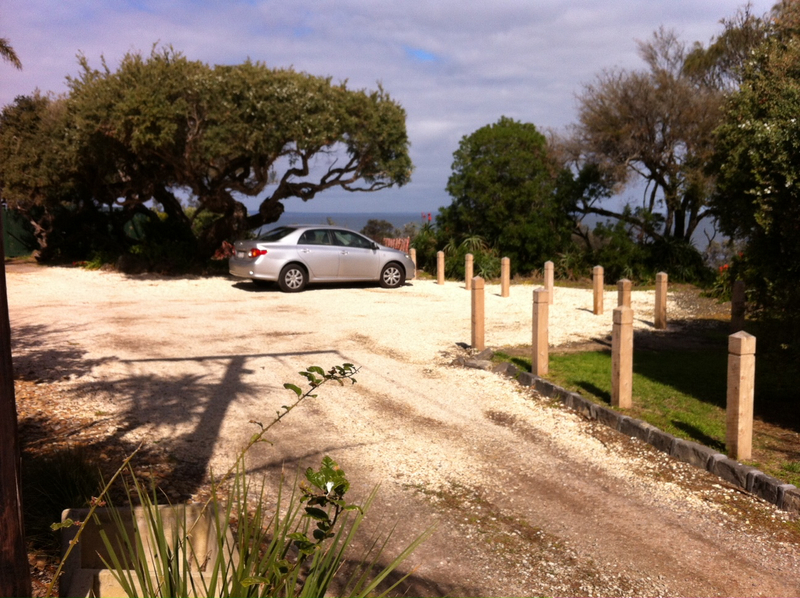 The line of bollards deviates into the Landside Reserve to allow parking where the car appears below. Clicking on photos will enlarge them. gazette a road reservation no wider than 11 metres abutting 394-402 Beach Road, with a vehicle barrier between it and a contiguous Landside Reserve free of ad hoc vehicle routes. The carriageway within the new, narrower road reservation should be as narrow as practicable and barriered so that its verges stay free of vehicles, and harmonize, as much as practicable, with the landscape of the Landside Reserve and the abutting lots 399-401 Beach Road, which are covered by the Bayside Planning Scheme’s Coral Avenue and Point Avenue Special Landscape Overlay. Red lines on this Council plan show road reserve and Landside Reserve boundaries near Point Avenue. Google map shows how much ad hoc vehicle routes have encroached on the coastal Crown land reserve. Click here to view plan of the entire Ricketts Point Landside Reserve boundary, all of which abuts road reservations. Click here to view the diagram of the boundary recommended for gazettal as the Ricketts Point Landside Reserve. The PROGRAM should be included in Bayside City Council’s Ricketts Point & Ricketts Point Landside Management Plan by a further amendment of it, or by a separate Management Plan for the Landside Reserve, following its 2014 upgrading to the status of a Public Conservation and Resource Zone in the Bayside Planning Scheme. Absurdity of Dead-end Road Reserve being as wide as Beach Road: Note that the reserve for the unnamed 80-metre long dead-end vehicle access road to the nominally Beach Road addresses of 401 and 402 Beach Road, Beaumaris, is – absurdly – the same 20-metre width as the road reserve for Beach Road, which is a four-lane high volume Arterial Road. The present minimum carriageway width on that dead-end vehicle access road is 3.6 metres, which is the same width as the present Point Avenue pavement, so a wide carriageway is not needed. That unnamed vehicle access road should be gazetted as an extension of Point Avenue to secure vehicle access to all the present Beach Road addresses from north of 405 Beach Road to Point Avenue, with a road reserve width not more than the 7 metres needed. The old, 20-metre wide reservation from Haydens Road to Reserve Road should be largely discontinued, with the land no longer so reserved all being included within the boundary of the Ricketts Point Landside Reserve. The part of that old reservation outside the suggested Reserve boundary should be gazetted to be the only vehicle access road for the nominally Beach Road lots from 394 to 402 Beach Road inclusive, and both the present direct connections for accessing Beach Road, which transect the Landside Reserve should be discontinued. Within the new boundaries of that road reservation, the carriageway should be of a width consistent with that of the carriageways in Point Avenue and Coral Avenue, and be sited so that the landscape of its verges harmonizes to the greatest extent practicable with the adjacent Landside Reserve, with a continuous vehicle barrier needed between all of the carriageway and the verge separating it from the Landside Reserve to prevent public vehicle use there. That vehicle barrier should end the ad hoc vehicle access from Beach Road, allowing those presently-trafficked routes to be planted as part of the Landside Reserve. Some mature trees might need to be removed, but planting of the greater area of the present ad hoc vehicle roadways and the two vehicle access routes to Beach Road, to supersede that use, will more than offset that loss. Pedestrian walkways to Beach Road can be delineated. BCS Inc. referred to this general problem in its two January 2009 submissions to a VEAC Investigation of Metropolitan Crown Land. 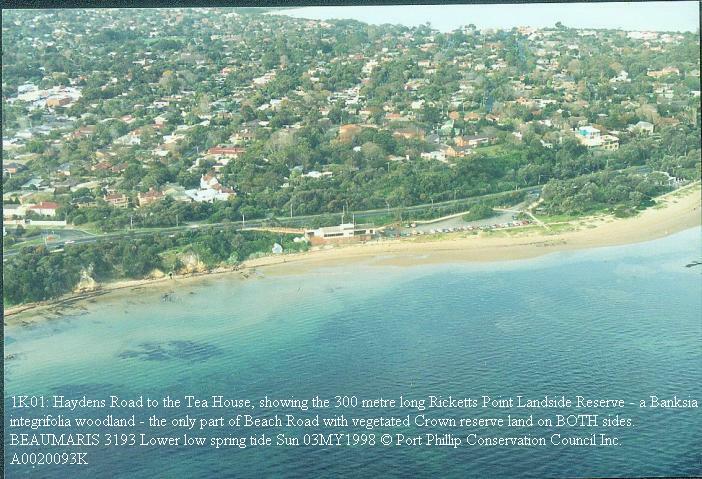 North of the present 405 Beach Road: The current version of Bayside City Council’s Ricketts Point and Ricketts Point Landside Reserve Management Plan shows in its Page 10 in Figure 1 some of the coastal Crown land on the east side of the Landside Reserve between 394 and 402 Beach Road as being outside the Reserve, and some being inside it. Those departures from a rectilinear eastern boundary line appear to have little basis in law or actual use. A rationalization in the access road to allotments, combined with a maximization and consolidation of redundant areas of road reservation to be added to a wholly contiguous Landside Reserve should apply to the area between 394 and 402 Beach Rd inclusive. Vehicle access to each nominally Beach Road allotment should be secured, by gazetting a new access road as described above. Such a gazettal would result in the Landside Reserve becoming a single contiguous parcel of land, which should be separated from those access roads by a vehicle barrier. That enhancement of the Reserve would be consistent with, and would helpfully re-inforce, the Significant Landscape Overlay (SLO1) on lots fronting Coral and Point Avenues. 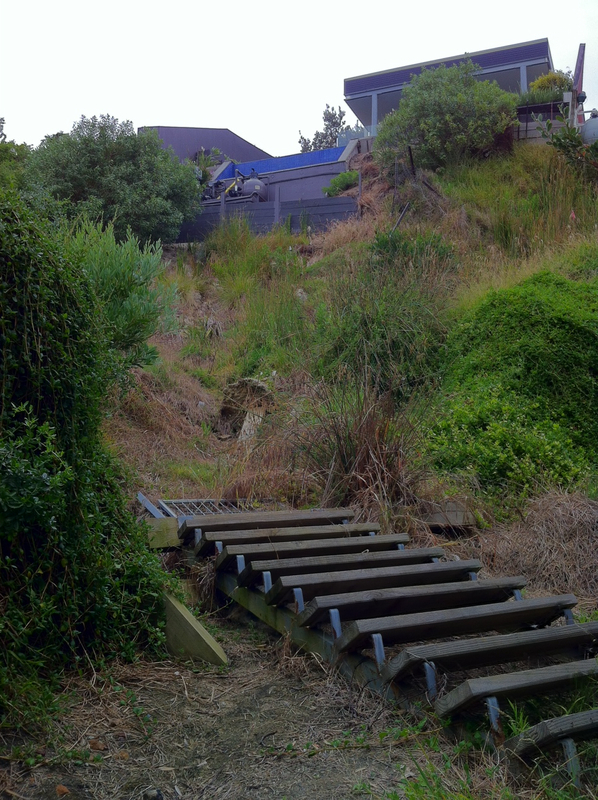 From the north of 405 Beach Road to Reserve Road: The legal fiction of persisting with an unusable road reserve along the length of the steep sandy slope on the west boundary of the private allotments from the northern boundary of 405 Beach Road to Reserve Road, all of which have Lang Street access – and would therefore be expected to all have Lang Street addresses, as a few already do – should be ended. Those lots should no longer have any direct access to the Landside Reserve usable by vehicles, and that could sensibly be made obvious by their boundaries with it being required to be fully fenced without openings usable by vehicles, even bicycles, and their Beach Road address designations being discontinued. The Fences Amendment Act 2014 appears to facilitate Councils’ fencing of private land bordering reserves. That fiction is depicted by a black line parallel to the line of boundaries to Beach Road seen at the foot of the relevant Bayside Planning Scheme map, although that apparent road reserve appears there in a Public Conservation and Resource Zone. The fiction should be ended by gazetting a revocation of that old road reserve, with the land then added to Ricketts Point Landside Reserve. 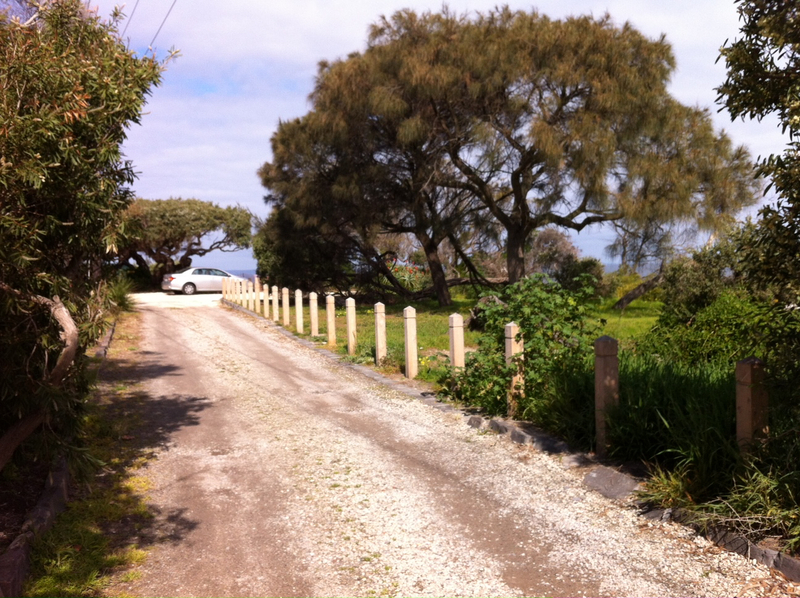 Fencing between freehold lots and the Landside Reserve: The boundary between all freehold lots and the Landside Reserve where there is no need for an intervening road reservation should be marked as such and fenced, to properly delineate and separate private land from the coastal Crown land in the Landside Reserve. Anomalies needing resolution: Various anomalies are shown in captioned photographs below. Letter from Beaumaris Conservation Society Inc. of March 2013 comments on Bayside City Council’s draft Ricketts Point and Ricketts Point Landside Management Plan of February 2013. 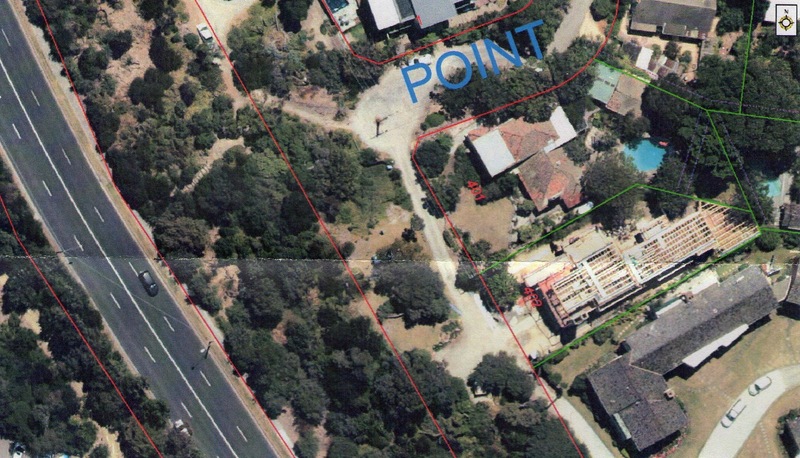 The strip of public land between the road reserve for the modern alignment of Beach Road and the line of private lots fronting it is all coastal Crown land, but it is not clear whether it includes all of the Ricketts Point Landside Reserve. It has a Public Conservation and Resource Zoning (PCRZ) as a result of Bayside City Council’s Amendment C110, which sought its upgrading to that. 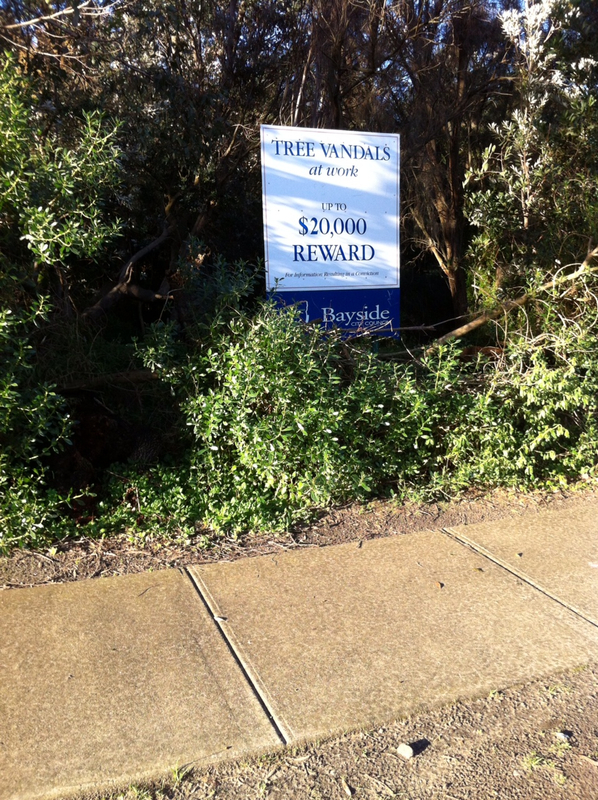 Illegal tree clearing across Landside Reserve was publicized in 2013 by Bayside City Council’s reward notice above, and was reported in 2011, where it gave access to abutting private land. 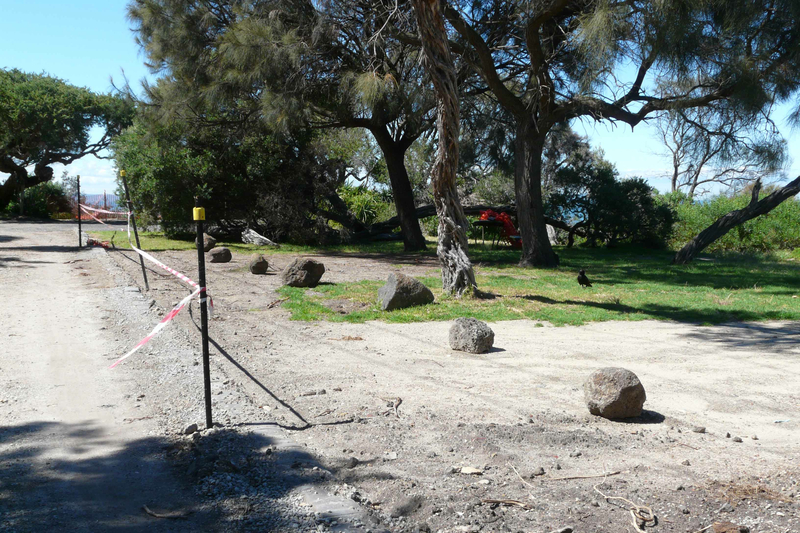 Bayside City Council proposed to intrude into the Landside Reserve in July 2005 to construct 16 car parking bays opposite the Ricketts Point Tea House. 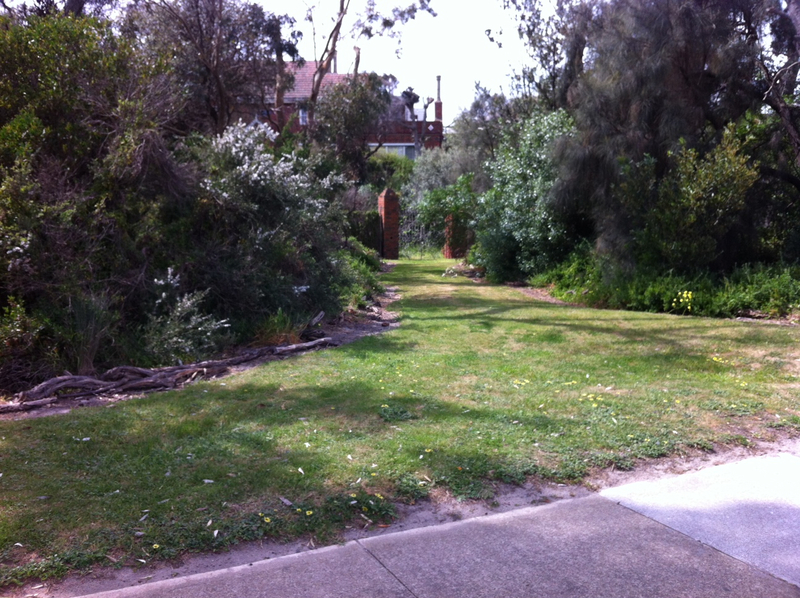 Its proposal failed in October 2005 when the Environment Minister refused to give his written consent, which is a pre-condition for any use or development of coastal Crown land under Section 37 of Victoria’s Coastal Management Act 1995.
off and replanted, with access coming from Coral Avenue only. Coastal Crown land does not exist for the free parking of private caravans. 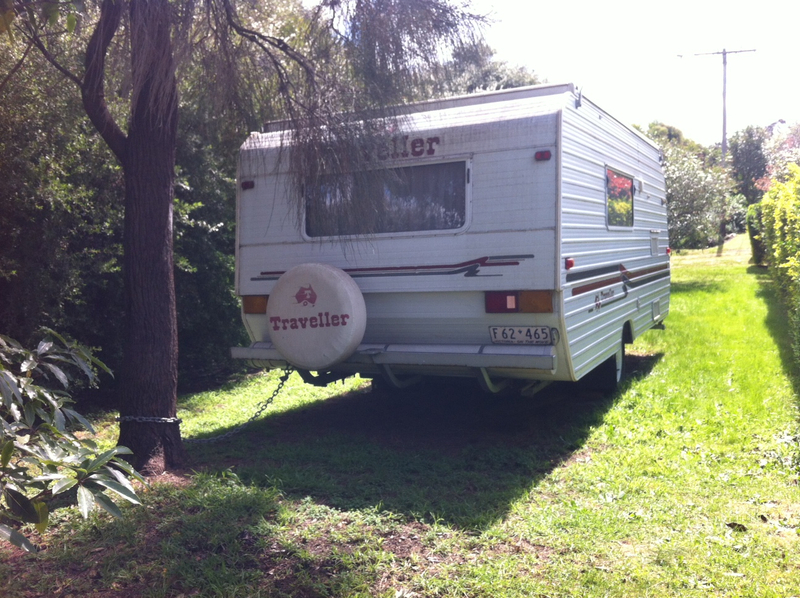 The Drooping She-oke outside 398 Beach Road should not be chained to such a caravan. 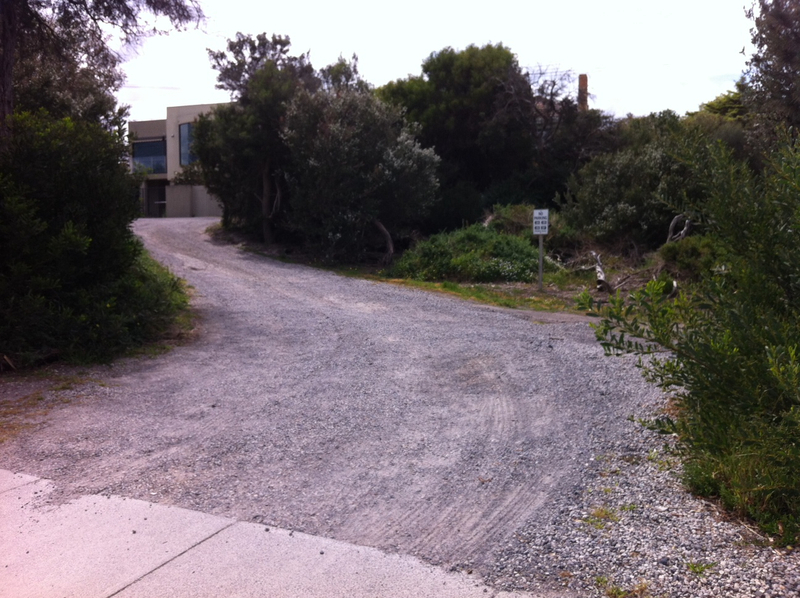 400/1 Beach Road onto coastal Crown land should be removed. 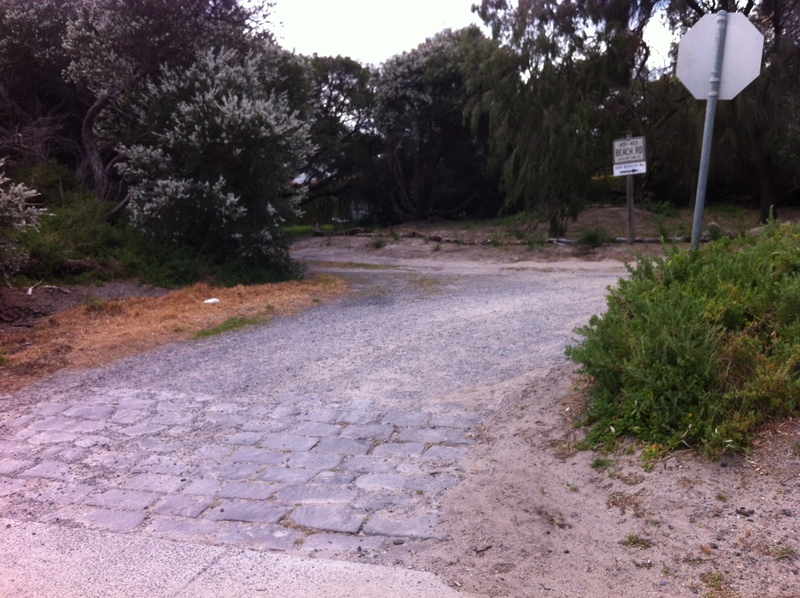 400/2 Beach Road onto coastal Crown land should be removed. 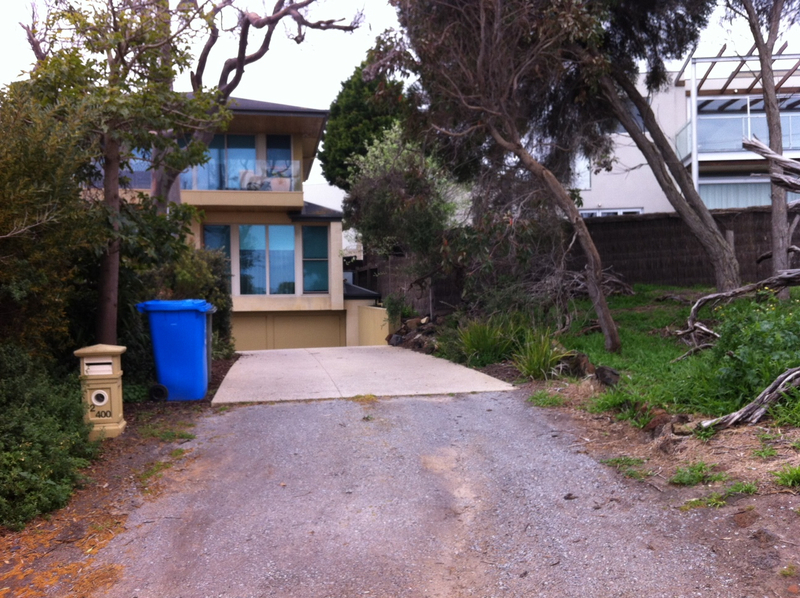 Beach Road to unused rear gates of 411 Beach Road, accessed from Lang Street. better placed on Melbourne Water’s site nearby in Reserve Road, should be made. 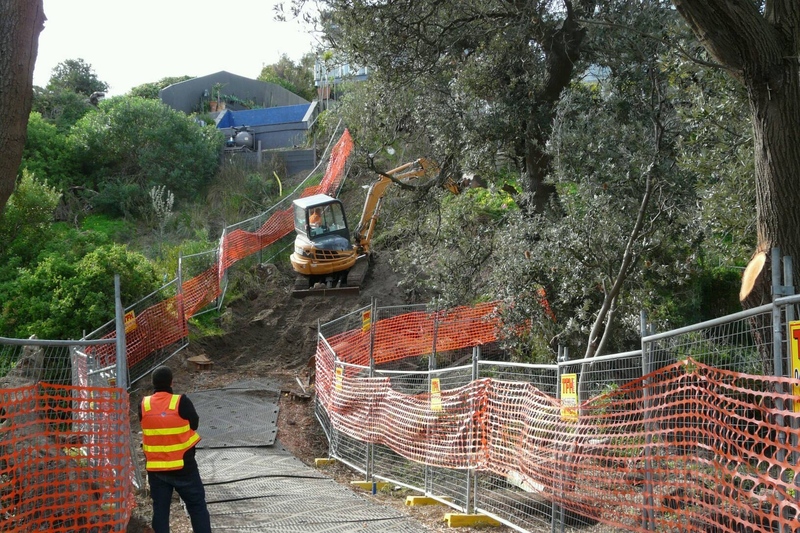 Landside Reserve, but its work is seriously set back by the substantial damage detailed above, and would be even more set back by the interference with the site – by using it to conduct works on 406A Beach Rd, rather than from that freehold lot – that granting of the above permit would entail. Click on the photographs below to enlarge them. The application below has been prompted by a land subsidence at the steep boundary between the above freehold lot and the Ricketts Point Landside Reserve. 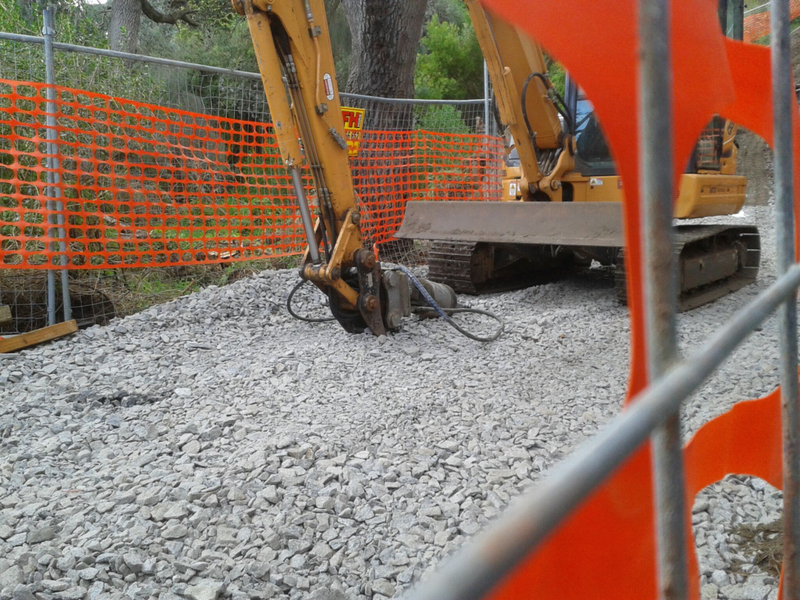 The remedy sought could entail removal of vegetation on the Reserve to provide access for remedial works. A pattern is appearing for this Reserve where it is expected to be compromised rather than some of the abutting overdeveloped freehold lots being required to be modified to provide access for remedial works, or even reduced in area so that they are entirely self-contained and no longer impinge on the abutting Reserve. 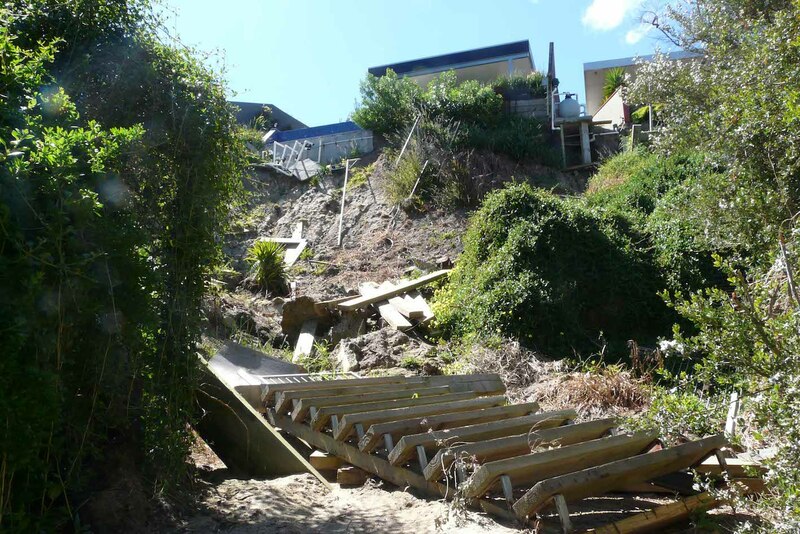 A landslip in September 2011 from 406A Beach Road, Beaumaris, onto the public land abutting it, left this massive debris on that public land, which is coastal Crown land managed as the Ricketts Point Landside Reserve. 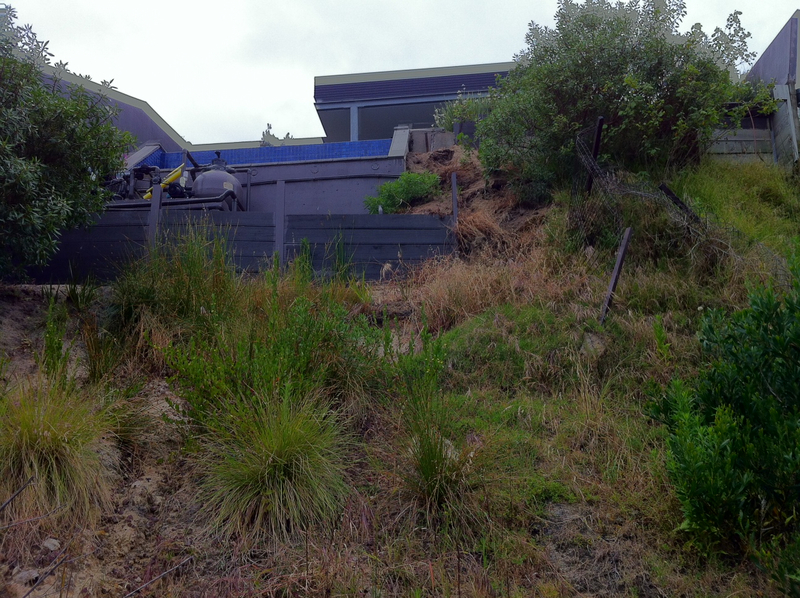 Heavy debris above, in November 2013, is still left abandoned on the Ricketts Point Landside Reserve, over 2 years after the September 2011 landslip from a freehold property above it. Notice of application for a Planning Permit to construct temporary access, retaining walls, and removal of vegetation on land abutting 406A Beach Rd, Beaumaris. Click on the notice to enlarge it. Click here for BCS Inc’s letter objecting to the above permit. Landside Reserve for which a permit is sought. The plan also has a line showing the top of the unstable sandy bank in the abutting lot on the south. That line is well inland of the seaward boundary of that lot. Click here for satellite view of the part of Ricketts Point Landside Reserve the above application applies to. Note the abutting private open space to the north from which access for works could be negotiated. to benefit an abutting private landowner. Click here for a list of the above works. Click here for Section 37 of Victoria’s Coastal Management Act 1995, which states that a person must not use or develop coastal Crown land unless the written consent of the Minister has first been obtained. Click here for Item 4.3 on minutes of the Bayside City Council meeting that granted the permit.